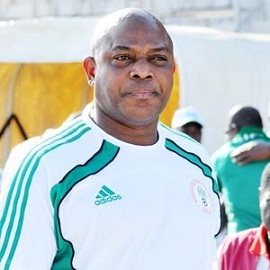 The Nigeria Football Federation has revealed it wants discussions with Stephen Keshi in the hope of persuading him to return as Super Eagles coach. The development is a U-turn from the governing body after it allowed Keshi's contract to expire after the World Cup. However, Nigeria's sports ministry is understood to feel Keshi has made" outrageous" demands over a new deal. But his reign as coach was littered with problems over money, as he experienced a number of delays in receiving his salary, and issues around his control of team selection. Following a meeting of the NFF executive committee, the board "mandated the technical sub-committee to open channels of communication with Stephen Keshi with a view to extending his contract, as the NFF is still interested in working with him". Meanwhile, Nigeria's sports minister Tammy Danagogo says football officials in the country must put aside their differences for Nigeria to go beyond the round of 16 at the World Cup. "The only way we can go beyond round of 16 is to ensure that the right things are done," he said. "If [the round of 16] is a jinx we must break it. And it is by ensuring that the right things happen; by ensuring that NFF does not complain that the minister is disturbing them. "It is by ensuring that club owners are not complaining against the NFF, it is by ensuring players and coaches are not complaining that NFF or club owners are short-changing them."